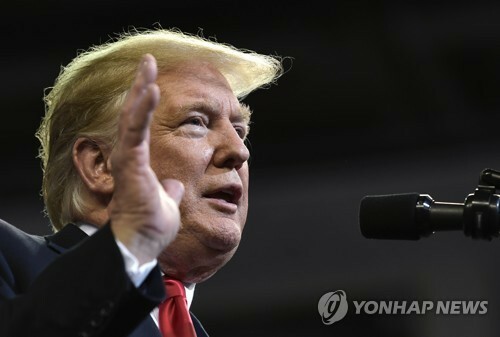 WASHINGTON, Oct. 10 (Yonhap) — U.S. President Donald Trump on Wednesday ruled out the possibility of South Korea lifting sanctions on North Korea without approval from the United States. South Korean Foreign Minister Kang Kyung-wha said earlier that Seoul has been reviewing whether to remove unilateral sanctions that were imposed on North Korea following its deadly sinking of a South Korean warship in 2010. South Korean President Moon Jae-in has been eager to improve relations with North Korea in order to induce its denuclearization and bring lasting peace to the divided peninsula. An easing of sanctions would be in line with North Korea’s wishes, along with a joint declaration with the U.S. to formally end the 1950-53 Korean War. The Trump administration has credited its pressure campaign, involving tightened sanctions, with bringing North Korea to the negotiating table to discuss the dismantlement of its nuclear weapons program. Trump and North Korean leader Kim Jong-un sat down in Singapore in June for the first-ever summit between the two countries. Kim committed to work toward “complete” denuclearization of the Korean Peninsula in exchange for security guarantees from the U.S.
Trump said Tuesday that a second summit will be held after the Nov. 6 U.S. midterm elections in one of three or four possible locations.